Rosa canina is a wild shrub species found throughout Europe as well as other temperate parts of the world. Its fruit, commonly known as rose hip or dog rose, is a favorite of traditional medicine and highly nutritious. Rose hip has been shown to contain great amounts of vitamin C, to which it owes its strong anti-inflammatory and antioxidant properties as well as its slightly sour, acidic taste. Several studies suggest the fruit can significantly reduce pain and improve mobility in rheumatoid arthritis sufferers as a result of its potent anti-inflammatory properties. Rose hip boasts a varied nutritional profile, supplying the body with generous amounts of vitamins A, E and K as well as calcium, magnesium, phosphorus and potassium, contributing to immune system, skin and circulatory health, as well as providing bone, muscle and cardiovascular benefits. You can eat fresh rose hip berries or tea made from dried and ground berries, the only difference being the fresh berries preserve their vitamin C content whereas other preparations don’t. What does Rosa canina look like? Rosa canina or rose hip is a shrub ranging from 1 to 5 meters in height. It can be found in open fields, woods, near river banks, practically anywhere in the temperate world. It has a rich, bushy green foliage and beautiful white-pink flowers that blossom in mid-spring and look like small roses with few petals. The fruit, known as rose hip or dog rose, is plump, bright-red or orange-red and elongated. What does rose hip taste like? It’s pulpy, sour-sweet, slightly acidic and zesty. You can either eat it raw or cook it (jam, marmalade, sauce, syrup, wine, tea). Fresh is better because you preserve all the vitamins and minerals in the pulp. Fruit are to be picked in late summer. 1) Great diuretic. Fruit acids and pectin in rose hip make it a great diuretic, cleansing kidneys of toxins and ensuring kidney health. Pectin is also efficient against constipation. Dried rose hip tea is recommended both as a diuretic and laxative. 2) Excellent natural laxative. Wild rose hip contains 24.1 g of dietary fiber/100 g of fruit, an astonishing amount which encourages more frequent and regular bowel movements. Fiber not only helps digestion, but it also regulates intestinal motility, relieving constipation naturally. Also, a generous daily intake of dietary fiber limits the time our colon is exposed to the toxins in waste which contributes to its health. 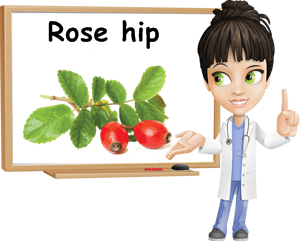 You can either eat raw rose hips or drink rose tea to help improve intestinal motility. 3) Rose hip for beautiful skin. Rose hip is both an astringent and a great source of vitamin A, a very skin-friendly nutrient with excellent antibacterial properties. Drinking or washing your face with organic rose hip tea cleanses the skin and gives it a healthy glow. Rose hip oil, which is for external use only, helps retain moisture in the skin thanks to its vitamin E content, keeping it nourished and elastic, but also exerts a strong antimicrobial action, preventing acne. Actually, some of the most efficient creams used for the treatment of scars, acne and burns contain rose hip oil. The anti-aging, anti-wrinkle properties of the fruit may also be a result of its high antioxidant content. 4) Amazing anti-inflammatory properties. Several studies have concluded that rose hip may help reduce inflammation and pain related to osteoarthritis. The vitamin C and antioxidant content of the berries are believed to be responsible for such benefits. 5) Rich in antioxidants. Rose hip contains beta-carotene, lycopene, leuco-anthocyanins, lutein, zeaxanthin, vitamins A and C, all potent antioxidants which hunt down and destroy reactive oxygen molecules called free radicals and maintain cell health. Free radical damage is characterized by abnormal inflammation levels and can trigger mutations in cells causing them to multiply uncontrollably and becoming cancer cells. Although it will reduce the overall vitamin content, cooking rose hips increases lycopene content so you get great benefits from both the raw and cooked forms of the fruit, depending on how you choose to enjoy it. 6) Promotes cardiovascular health. The antioxidants in rose hip help reduce inflammation and maintain blood vessel integrity, thus reducing heart disease risks. I remember from when I was a child that my grandfather used to drink rose hip tea all year round and never had high blood cholesterol level or artery problems, despite enjoying rich (fatty) meals quite often. 7) Antiviral properties. The high vitamin C content in rose hip makes it excellent for boosting the immune system. Vitamin C supports the immune function by increasing the aggressiveness of white blood cells which respond faster and better to viruses and bacteria, reducing infection risks as well as recovery time. Conclusion. Rose hip is a truly healthy fruit, rich in potent antioxidants and essential nutrients. It is a natural antibacterial and anti-inflammatory, great for skin and immune system health. Its vitamin C content not only helps reduce inflammation and manage pain associated with inflammatory conditions such as rheumatoid arthritis, but also prevents lipid oxidation at the level of the blood vessels, improving circulation and contributing to maintaining cardiovascular health. It boosts immunity and makes a wonderful natural diuretic and laxative.